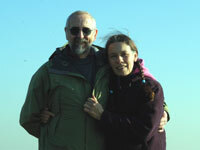 February 08 - The highlight of the month was our week away with the usual suspects. We had beautiful weather as you will see below. Steve was very busy at work and it was announced that in a major shake up he would have to apply for the new post of Head of IT. After much debate he decided to try and apply for redundancy/early retirement but he was told he would not be given it!! Jane found herself covering a lot of shifts at the surgery and there were some weeks when instead of just working two and half days a week she worked a full five days. This meant on some days she started at 07:45 and with a split at lunchtime she didn't get home until after 19:00 - a long day by anybody's standards. After watching avidly the series Life on Mars we have waited with baited breath for the sequel - Ashes to Ashes. There is no question this series is not the same as Life on Mars, it is even more tongue in cheek and there are moments when the cast are playing for the laughs but the writers have never intended for this to be a serious drama. Philip Glenister as DCI Gene Hunt is excellent and holds the whole thing together whereas his foil, Keeley Hawes as DI Alex Drake is somewhat wooden. The introduction of a female lead helps to demonstrate the distance travelled from the sexual inequalities of the 1980s. It would be a mistake not to mention a third star of the show the Audi Quattro. The purists tell us that this particular model wasn't sold until two years after the period but that's pure pedantry and apparently the phrase "Fire up the Quattro" is becoming quite a catch phrase. So far we've enjoyed every episode and we look forward to the characters being developed. The second week of February is our annual holiday with the extended family. This year we only has to travel a couple of hours to Stonehouse in Gloucestershire. For once we managed to get away relatively early on the Friday morning and so we arranged to fit in a walk before heading off to the house. The accommodation has to be large enough to sleep all ten of us in comfort with plenty of bathrooms, large kitchen, dining room and more than one place to sit so that whilst some watch TV others can sit and read or just relax and chat. On our return from holiday we'd arranged with Graham & Sue to help remove a couple of apple trees from a friend's garden. In just over an hour we'd despatched the first tree as you can see from the picture. The second tree was removed to the stump in less time than the first and we carried all the larger pieces of wood round the house to our trailer. Some time ago we decided that anything with less than a 10 centimetre diameter was not worth using for the wood burner because it took too long to cut for the amount of heat it would generate but Graham and Sue were happy to have smaller pieces so we finished up filling the trailer with both trees. The following weekend we unloaded our share of the wood into our wood barn so that it would be seasoned in time for next winter. For Jane's birthday we agreed to accompany our tight circle of friends to Rockingham Forest for a walk followed by lunch. This area is renown for its red kites but unfortunately bird life was in short supply and we saw nothing of note let alone the red kites. The ground was carrying a heavy frost but the early sun soon melted the top layer and the tracks became quite tacky. It was warm enough at lunchtime for us to sit outside and eat our sausage baps. We had hoped to have pasties but the cafe was so busy they'd sold out by the time we queued to get our orders. Jane had a good day and it was smiles all round as you can see. For Jane's birthday evening out we decided to try The Walnut Tree on the outskirts of Blisworth. We'd been here before for Sue & Graham's wedding anniversary on a quiet Wednesday evening and it was really good service however a group of ten on a Saturday night could have been a different situation. 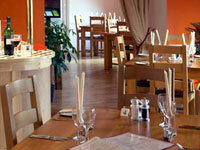 As it turned out the service was excellent and the food well presented. The only criticisms were that the tables were very spacious and we were too far away from each other and the chips should have been crisper. Nick and Martin's expert view (they eat a lot of chips) was that they would have been crisper if the fat had been hotter. 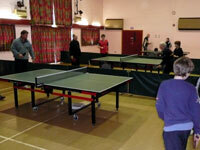 Jane's table tennis activities go from strength to strength. She now runs the village table tennis club every Thursday evening, she plays for one of the Gayton village teams and she also enters for competitions within the district. 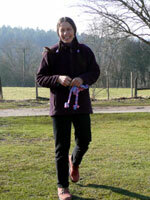 She is also the treasurer for the district teams. 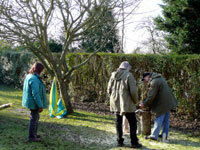 The picture was taken at Bugbrooke for the all day competition. Jane reached the quarter finals. 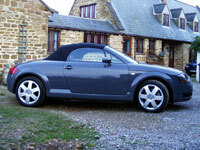 Steve's Audi TT is now 7 years old and has just 42,000 on the odometer. For the first time one of the side lights failed but the instructions in the manual tell you to take it to an Audi dealer to get it replaced - how ludicrous is that? Gone are the days when you could lift the bonnet, undo a few catches and swap the bulbs over. Modern cars are a complete mystery, more plastic than metal in the engine compartment. For the first time Steve decided not to take the car to Audi garage for its service and MOT. It needed new rear springs (corrosion on one and the other had broken at the base) and new front suspension bushes. It indicates that it isn't just the miles covered that make a car deteriorate but time. Jane's Smart is giving her some problems because she needs new tyres but we cannot find the socket that will undo the locking wheel nuts. It seems garages don't carry a range of different types. The search continues.